This delicious sweet Italian sausage and white bean soup recipe has a rich flavor thanks to the addition of tomatoes and fresh spinach added at the very end. 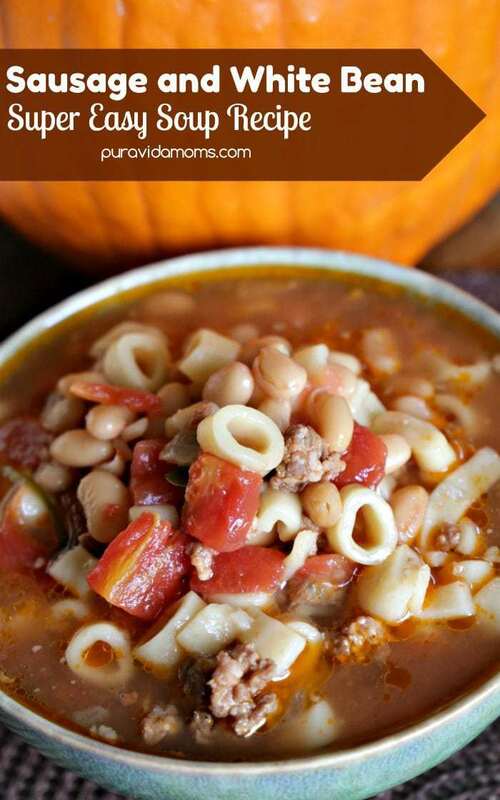 The perfect fall recipe, it can be made stovetop, slow cooker or pressure cooker! There are two things that I absolutely love in a Fall soup recipe- when it’s super easy to make, and it’s budget friendly. Because let’s face it- Fall is a precursor to Winter and that means holiday spending. So I’m super excited to bring you this easy, delicious and money saving soup recipe, and show you how I make a double batch and freeze half using the FoodSaver® FM5200 Vacuum Sealer and FoodSaver® 11″ x 16′ Vacuum Seal Roll, 2 Pack. I’ll admit I am totally new to the process of vacuum sealing, but I’m excited to showcase how it’s done, and of course share the hearty sweet Italian sausage and white bean soup recipe too! I was intrigued by the FoodSaver® FM5200 Vacuum Sealing System because I was looking for an easy way to batch cook some of our favorite recipes and then unfreeze them later. Homemade frozen meals are my go-to for busy weeknights and entertaining (especially during the holiday season!) and batch cookings saves us money- and saves me time. And have you ever thought of marinating food ahead of time by using the FoodSaver®? I saw that idea on TV and thought it was genius! The problem I was having is that with traditional freezer bags, I was either having trouble getting the air out to store them in the freezer efficiently (we only have one small freezer so space is a consideration) or the zipper seal would break and the bag would open- either making a mess or giving the food freezer burn. 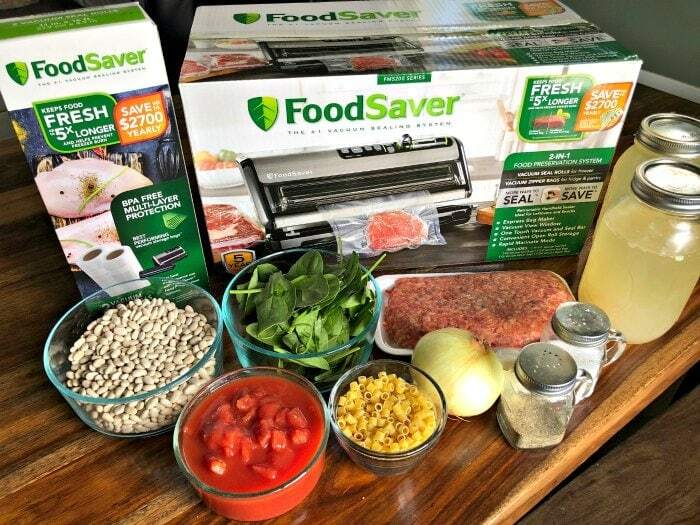 I think a FoodSaver® FM5200 is the solution asFoodSaver® keeps food fresh up to 5x longer* and helps prevent freezer burn (*compared to ordinary storage methods), but I will admit the whole process made me a bit nervous because it looks so complicated! It’s not though- and I’ll walk you through it. When you first take the FoodSaver® FM5200 out of the box, each part is also individually labeled with how to use it as well. You will first have to lead the roll the first time, but it’s super easy. Don’t forget to plug in the machine like I did. After you have the food you want to seal (which can be liquid like my soup, or dry, like meat, or even things you want to vacuum seal to take on a trip) you just cut a bag to the size that you want- this eliminates bag waste and saves time and money. Press the bar and wait! The FoodSaver® FM5200 will vacuum out all the air and then seal the end of the bag. I will say this process is a bit louder than I expected, so maybe don’t do it during nap time like I did. I found my FoodSaver® FM5200 Vacuum Sealing System and the FoodSaver® 11″ x 16′ Vacuum Seal Roll, 2 Pack in the food storage aisle at Walmart. I think these products are a great investment for busy moms like me who want to save time and money on their kitchen and food budget. Plus, there’s two Rollback offers on FoodSaver® products right now at Walmart! The FoodSaver® FM5200 Vacuum Sealing System is $142.99 (original price $169) – from 9/15 – 12/22, online only AND the FoodSaver® 11″ x 16′ Vacuum Seal Roll, 2 Pack – $15.99 (original price $17.98) – from 9/15 – 12/22, online only. So hope online and grab yours before 12/22/18! Heat skillet on medium heat. Add olive oil, onion and garlic and sauté until the onion is translucent. Add sweet Italian sausage and brown, breaking apart into small chunks. Transfer sausage, onion and garlic to slow cooker or pressure cooker. Add all other ingredients except spinach. If using slow cooker, cook on low for 6 hours, or high for 4 hours. In pressure cooker cook on high for 25 minutes. When soup is cooked, add spinach and recover for about 10 minutes. Serve hot- this recipe makes a double batch so make sure to freeze half or plan for a large crowd. I need a Foodsaver! I have the cheapest plastic containers and my food always ends up freezer burned! This is a new favorite for fall nights!